geophasms is an on-going series of expanded cinema presentations. Exploring a concept I refer to as “dissonant ethnography” I aim to use projection-based installation in ways that uniquely alter perceived narrative, making the experience not only site-specific but viewing-specific, a culmination of intentionally random coincidences with perceptual and physical filters that disrupt or realign the media as it occurs. It is an attempt to produce an episodic, modular documentary film describing the unique ontology of the Polynesian diasporic experience by examining a minute facet, a subculture, or otherwise fringe occurrence that doesn’t necessarily speak for the whole but is nevertheless descriptive of an idiosyncratic reality that exists within the larger cultural spectrum. The distortions inherent in any subjective description of events are heightened and highlighted through the series of willful obfuscations, intentional deletions and randomization. geophasms is a system of cinema that operates as a type of feedback loop, one that actively disturbs itself. The first presentation, geophasms (went split afakasi), is a collection of cinéma & audio vérité produced on O’ahu, Hawai’i in early 2016. Conversations between family members discussing the reality of life in Hawai’i as Samoan-Azorean immigrants, as queer people, as disoriented progeny of cultural assimilation, as current navigators of extreme socioeconomic disparities. The image and sound are contained on separate loops, each presented in asynchronous revolutions that never align. To further abstract the presentation and to highlight the gaps in knowledge and veracity of observation, two elements are introduced: a reflective, black mirrored tank of water and binaural low-frequency tones. The image is projected into the tank and bounced onto the screen, while the loops of low-frequency tones are fed into the soundtrack. The result is a purposeful severance of the cinematic experience, with the image destroying itself via pattern interference and the soundtrack receding into the deluge of noise. The second installment, geophasms (sheer mala copy), was exhibited at Bronco Gallery in October 2016 and produced specifically for the interior of a 1991 Ford Bronco. This installation was comprised of a single-channel digital video projection and two separate stereo audio tracks played within and around the stationary automobile. Visitors were invited to sit inside the cab of the gallery, listening to conversations unfold between an absent driver and passenger as they “talk story” while navigating the island of Kaua’i. The separate audio tracks are edited into asynchronous loops, so that ambient field recordings of surf, traffic, marketplaces and island radio stations from the rear-mounted external speakers drown out portions of the internal dialogue, giving each viewer a unique experience. 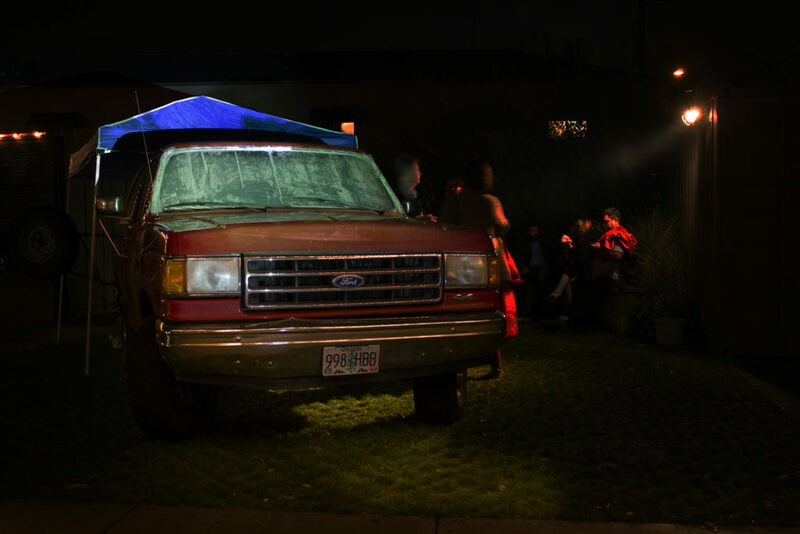 High-definition video captured from the dashboard of the original vehicle are projected onto the windshield of the surrogate, the Bronco Gallery, in a third asynchronous loop. “sheer mala copy” is a fleeting iteration of an on-going series of expanded cinema presentations entitled geophasms. Talking story is a ubiquitous cultural element in Polynesia, unstructured discussions of issues pertaining to daily life, family history or spirituality. It is a method of knowledge transference, an oral tradition that has permeated all aspects of life in the Pacific and works to elongate time in multiple directions. It has the power to expand a casual afternoon stop-in into a full day dialogue, and a memory of a car ride into a multi-generational timeslip. Here, talking story is further mediated through extensive use of the cut-up technique to create small loops of interlocking narratives and concrete poetry, deviations of time and space, fifth dimensional exchanges of knowledge. These conversations recorded on the islands of O’ahu and Kaua’i have been transposed to the interior of Bronco Gallery.